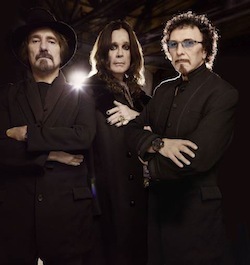 Black Sabbath bassist Geezer Butler has a feeling the band’s current tour will be their last. He’s still enjoying life on the road as they support acclaimed album 13 – but admits he’s starting to find it difficult to keep going. Butler tells the Chicago Sun-Times, “I just got a feeling. It’s getting tough, it really is. I can’t lie about that. I’m old now; it really is tough going on every night. You wake up next day will pains you never had before. He isn’t sure when his final show will be, but asserts “I’ll know when the day comes I can’t do this any more, can’t play to my usual standards. That’s when I won’t go out any more. Sabbath guitarist Tony Iommi, who’s continuing to receive treatment for cancer, recently said he hoped they’d be able to play 13 in full at some point in the future, and perhaps make another album. Frontman Ozzy Osbourne has stated their future is entirely down to Iommi’s health. ‹ 8/15: IL & MI THIS WEEKEND, ALLEN LANIER, 30TH PARTY, MORE. That SABOTAGE stuff is bold but Jim Florentine once mentioned on TMS that he felt strongly about that album as well so I’m not alone. SABOTAGE lacks nothing. 2 intro type songs: HOLE IN….SYMPTOM…..2 epics: MEGA…THE WRIT…instrumental: SUPERTZAR….plus THRILL + INSANE……You know bands like WINGER are doing whole albums, for me SABOTAGE would be that 1 album. Tonight I saw Black Sabbath perform in Tinley Park outside of Chicago. I was on the fence about going, but when I read this article, I said to myself “Man, I probably will never see these guys play together ever again” Being a HUGE Dio fan, having watched the youtube clips of Sabbath’s performance in Texas and hearing Ozzy’s voice sound terrible, and never having seen Sabbath with Ozzy, I really wasn’t sure if I wanted to check it out. But my 7 year old daughter said “Daddy, just go. Thursday is your birthday. It can be your present.” So I went, and I have to say…it was simply epic. To those of you who think Ozzy’s voice is off, I can honestly say he amazed me. Was he perfect? No, but he was close. He sang the epic songs from back in the day and he was right on. Without saying, Tony and Geezer are the finest guitar and bass players who walk the planet today, and their skill has not diminished. If you are on the fence about going, GO. The show reminded me of how powerful metal is, and to see 3 of the 4 creators of metal perform together was legendary. Did I mention SABOTAGE? You know what s f#@kng amazing about that album? The way that SYMPTOM fades into MEGALOMANIA. There used to be an AM radio station I believe called Z ROCK and they actually made it a point to play that song. They played the acoustic outro of SYMPTON as if it were part of MEGALOMANIA which is fine ’cause it fits perfectly. They say THE WRIT was a song actually written by Ozzy. His vocals on that album are the best of his career. On DIARY OF MADMAN, he also sounds great. Richman, do you have any thoughts on Sabotage by Sabbath? That’s an interesting Top 5. We’ll have to discuss it when Eddie puts you and I on the show. I’m going to sabbath a week from Monday in San Jose California. Ive heard mixed reviews too. Some people love it. Some say they hated it. It’s black sabbath. Ive only seen them once with Ian Gillian on the born again tour. I loved that show. Can’t wait. I will post my review at some point. Remember. Fairies wear boots! Saw Sabbath last night in Illinois. I am not a big Ozzy fan and never saw him with Sabbath, but the show was insane. Ozzy’s voice was awesome, not perfect, but he belted out the old classics without any problem. Geezer and Tony were epic. Check them out if you have not ever yet, this might be your last chance according to good old Eddie Trunk. According to Geezer who just said he’s feeling it and might be done soon!